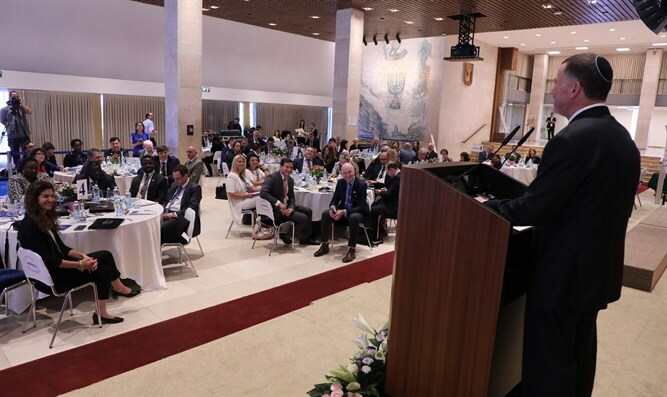 Knesset Speaker Yuli Edelstein addressed a conference honoring friends of Israel in parliaments around the world Tuesday. Edelstein addressed the controversy over the Polish Holocaust Law. "The misunderstandings between the two countries could have been avoided if there had been a joint discussion in the first place and no unilateral steps would have been taken," he said in response to a question by Polish Minister of Agriculture Jan Krzysztof Ardanowski. In response to a question by British MP Ian Austin about Israel-Palestinian Authority relations, Edelstein said: "If I had to point to one person to blame, it was Abu Mazen (Mahmoud Abbas), and he is working to undermine the relationship." MP Austin said: "I apologize to the people of Israel for the insult and unpleasantness caused by the statements of members of the Labor Party, of which I am a member, which included Holocaust denial, a comparison between Israel's actions and Nazi actions, calls for a boycott of Israel, and more. We must get rid of this poison in our party." The Conference for Chair of Parliamentary Friendship Group includes parliamentarians from around the world, including various heads of their local Friends of Israel caucuses. 65 delegates from 32 countries attended the event in the Knesset Tuesday. During his speech, Edelstein called on the parliamentarians to push for their respective governments to recognize Jerusalem as the capital of the State of Israel as the US and other countries have done. "I urge each of your countries to do the same. Recognize Jerusalem as Israel's capital, move your embassies to Jerusalem. I am confident that in doing so, you will enhance the chances for a strong peace in this region."